You've found the “U.S. Lincoln Sheep Breeders” page here at Hobby Farm Wisdom! If this is the first time you have visited our site: Welcome! 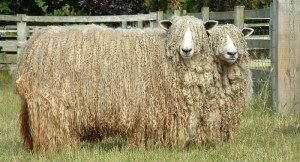 The Lincoln is one of the four English longwool breeds and is referred to as the world's largest breed of sheep. Mature rams weigh from 250 to 350 lbs and ewes 200 to 250 pounds. Lincolns show great width, they are straight and strong in the back. The fleece is carried in heavy locks that are often twisted into a spiral near the end. The staple length in Lincolns is very long ranging from 8 to 15 inches with a yield of 65 to 80%. The fleece usually parts over the back on lambs and sometimes on older sheep. Lincolns produce the heaviest and coarsest fleece weighing from 12 to 20 lbs which ranges from 41.0 to 33.5 microns in fiber diameter. Although coarse and somewhat hair-like, the fleece does have considerable luster but is in great demand for spinning, weaving and many other crafts.